Tartan Day is observed annually on April 6. This celebration is a Scottish heritage and it is observed by all communities of Scottish diaspora. Tartan Day is celebrated on date, when the Declaration of Arbroath was signed in 1320. On this day Scotland became independent from England and could use military action when attacked. Although Tartan Day is a Scottish observance, it is also celebrated in other countries. Mostly these are the countries with numerous Scottish diasporas: the USA, Canada, Australia. The modern celebration of Tartan Day began in the mid of 1980 in Canada and ad hoc event appeared in New York City in 1982. Later in the 1990s the modern format of the observation was spread to all Scottish diasporas. Only in Australia the holiday is celebrated on July 1 and it is called International Tartan Day. This day commemorates the repeal of the 1747 Act of Proscription that banned the wearing of tartan. 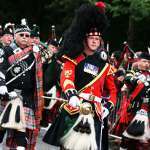 Today Tartan Day is celebrated in Scotland, Canada, Australia, New Zealand, the United States and Argentina.